Gundam Age 07 - Physical Attack Gundam Upgrade? Look at my big shiny gleaming sword! 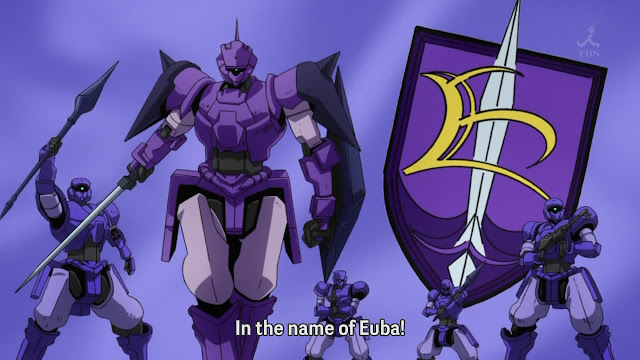 This week on Gundam, we get off our super emo mode Gundam pilot and instead, get to watch him parade around like an idiot. It was just painful watching him go around questioning the war in a colony that isn't his home. Nothing like being absolutely naive to make the perfect Gundam protagonist, I mean, remember Shin? A subpar episode for a subpar anime, I think I prefer my emo in my anime over this crap. Anyone with half a mind would have just taken the food, it is rare stuff after all; Once in a lifetime opportunity! I love how throughout this whole episode, he tried to stop the fighting in the colonies when it isn't his home or his fight. People aren't going to stop fighting just because you ask them to, only way is if he steps in and and subdues both sides; Fight fire with fire. Their fighting is for land and money, they are just masking it as part of the old war. It was just funny how simple a concept it was yet he couldn't understand it. Next we get the other set of genius kids. "Lets all protest, that will stop them!" That just reminded me of the occupy Toronto movement, how I laugh at them. To be clear, I don't support the movement, but neither do I support them being evicted. If they like having their message fall on deaf ears, let them have their demonstration of futility. Back on topic, I just found it hilarious that the kids protests against some mafia looking guy, that is always a good idea. Then we move on to the next scene with Flint getting played more. If the UE nest was really found, I'm sure the Federation would act. 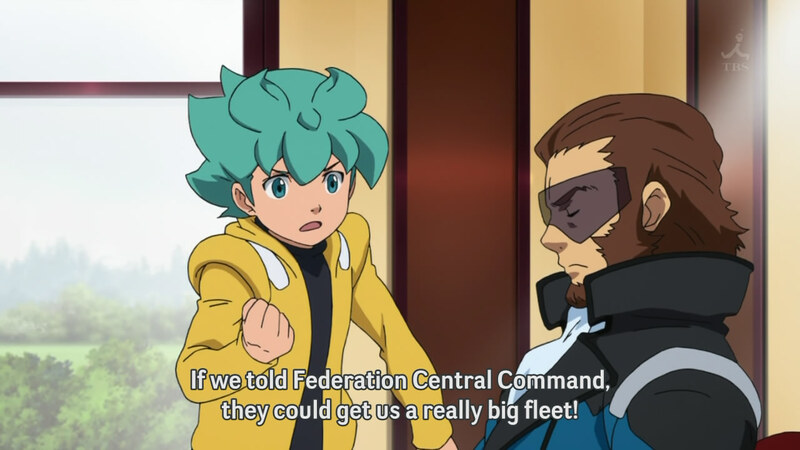 The problem is the captain can't use the Federation since he would be jailed, but he can't tell him that. Instead, he plays on his weakness to get him to agree with him. 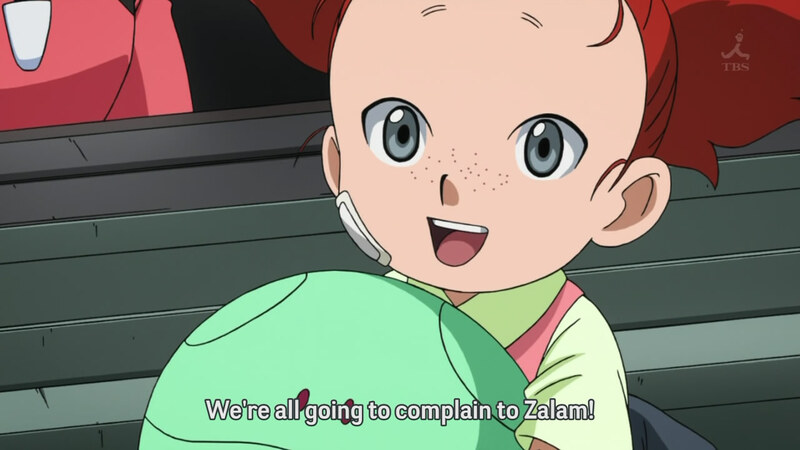 How simple and easily tricked is our Gundam pilot? I guess that is why he is just a kid, it fits together at least. Of the two sides, the purple mechs were obviously kooler. How is that old geezer still able to pilot a mech? At one point your crappy reactions catch up to you and you fail as a pilot. With the captain buying multiple war ships and mobile suits, you would expect them to battle it out with more then just a 5 v 5. They gave the impression they were rich, to bring the fight to the actual manor, you better big a large and confident force. I did not see that with a measly five mechs when the in town skirmishes were already 2-3 mechs fighting on each side. 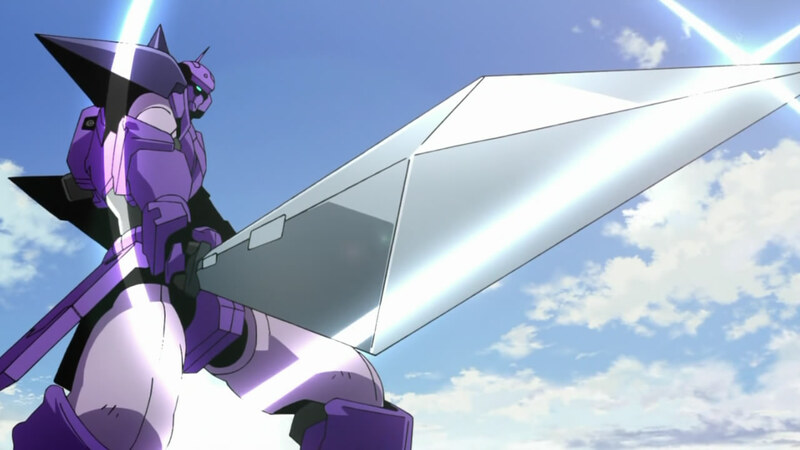 So we finally get our new and improved melee Gundam. 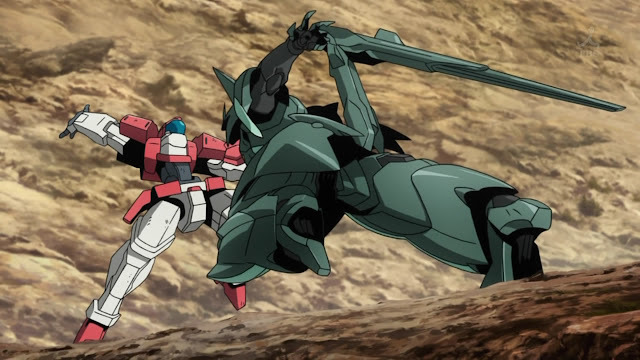 Watching a Gundam use fists instead of beam sabers just looks awful. You remove the most flashy element of the battle from the Gundam series. 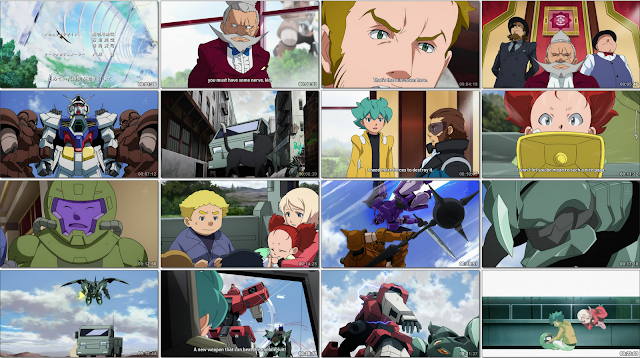 It feels less like Gundam and more like Ben-To without the awesome jokes and characters. 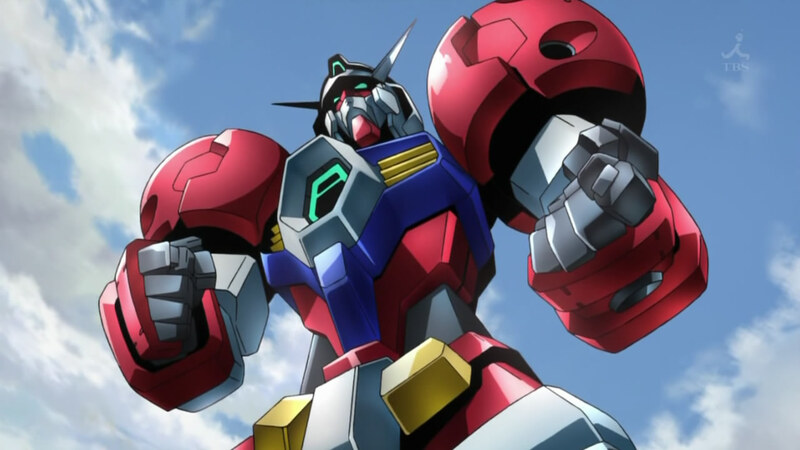 I hope this crappy punching version passes soon, it is just a horrid design for a Gundam. 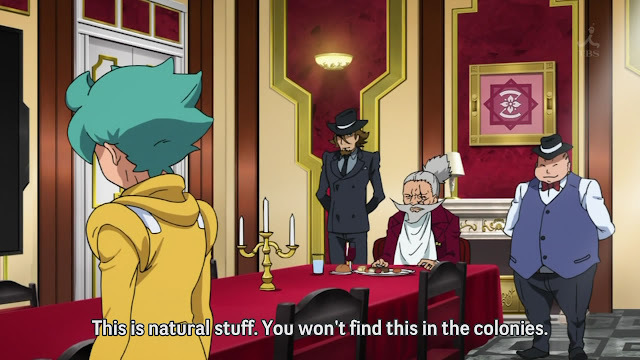 I guess next episode we will get to see how Flint will magically stop an age old feud through the magic of his words. They need more angsty beam saber battles between mobile suit pilots talking to each other. Battling an unknown enemy is boring, they are treating them like fighting an AI. At least focus more on the drama and the emoness, I already knew Flint was an idiot, you don't need a whole episode dedicated to telling me that.